Y’all know I’m a sucker for a good mom hack! How many times have you skipped a nap because you were short on time? Okay, first of all let’s imagine that you have time for a nap. Maybe you’re like me with a kid that naps and you want to nap too, but know you have stuff to do. Well, welcome to the most popular psychoactive substance in the world, caffeine. I’m going to give you a mind blowing mom hack that you probably didn’t think about doing. 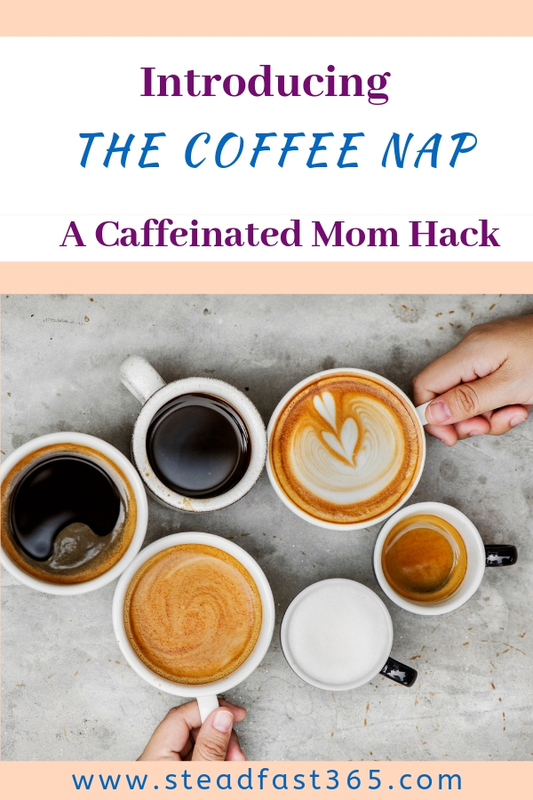 Let me introduce you to the beloved coffee nap! This is gonna sound weird, but there’s scientific proof giving you the green light to try coffee before a nap. Not just any coffee and not just at any time. There’s a science behind it. Keep on reading for the inside scoop! I stumbled across this gem of an experience during my postpartum journey. The gem was realizing that coffee gave me energy during a nap. I know, energizing while you sleep, weird concept right? Early into the postpartum journey I was exhausted. My mom, being the avid coffee drinker she is, brought her own coffee maker to my house because I’m not a daily coffee drinker. 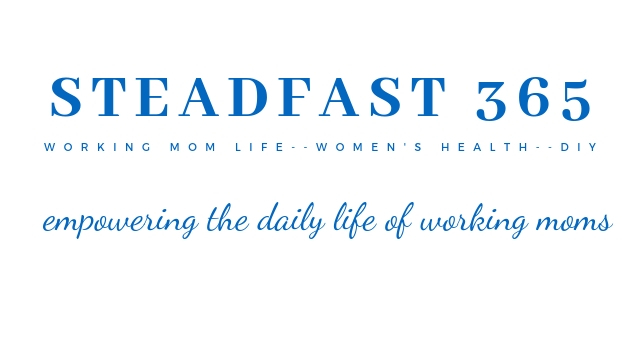 Off and on throughout my first postpartum week I would get headaches from the hormone craziness. Caffeine helps with headaches, so I drank the coffee my mom made. I was so tired at the time too, so I took a nap literally right after drinking the coffee. My nap was only about 15 to 20 min which in postpartum world felt like forever. That distinct feeling of waking up feeling alert during such a time was memorable. I wasn’t bouncing off the walls hyper or anything. There was just an alertness instead still feeling tired and foggy. I didn’t really think that much of it. I went on about my day and did the same thing again a couple days later. Yep, the same thing happened. 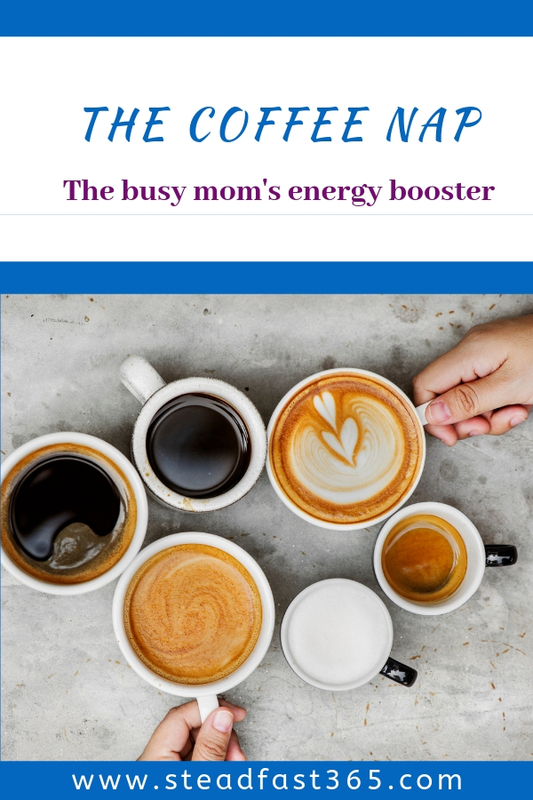 Somewhere in my pharmacist brain I knew there was a link between caffeine and our sleepy chemical but being postpartum and exhausted I wasn’t even thinking about it. That was work related and I had my new mama blinders on. Eventually I recalled the relationship between the two, researched the science behind it and boom…mind blown! Basically you have these chemicals called adenosine that make you tired. They fit comfortably, like a puzzle piece, into the same receptor that the caffeine wants. They actually both really want to bind to the receptor, so they compete. Kind of like musical chairs. When you sleep, the adenosine quantity goes down which leaves seats open for the fresh caffeine you just drank. When you’re sleeping, the caffeine gets a chance to bind and take advantage of the open receptor seats. They latch on and you now get caffeine that gets right to work! The trick is that you have to time it right and we’ll get to that. Why less than 30 minutes? Remember when I said adenosine starts to clear out when you sleep and caffeine can take a seat? Well, this research shows that if you sleep past 30 min you go into a deeper sleep. You may miss that golden opportunity. In pharmacy there’s a little something called synergistic effect. Basically it’s when the combined effect of two processes works better than each alone. Research shows that this happens with caffeine naps. This research studied the alertness of tired people after a short nap. They either took caffeine, napped or took caffeine directly before a nap. The results showed that when tired taking caffeine directly before a short nap should leave you feeling more alert upon waking than caffeine or a nap alone. Remember when I said you cant just drink coffee and nap at any time and expect these results? Remember, this is for a quick nap only and you want to avoid a nap too close to bedtime due to caffeine’s stimulant effects. This study showed that it is best to avoid caffeine six hours before bedtime to avoid the sleep disturbing effects. These results differed among the research. Remember when I said not just any coffee will work? You obviously don’t want decaf since our focus is caffeine here. Although decaf still has some caffeine content, it’s not enough. You also don’t want something on the opposite end of the spectrum that is overloaded with caffeine. The consistent amount was about 200mg caffeine. That is approximately two cups, depending on the type and serving size of the coffee. This study found that 200mg of caffeine and nap combined had more alert status after the nap than either treatment alone. So the pharmacist in me wants to make sure you know that caffeine has side effects. These include central nervous system stimulation and increased blood pressure. Make sure you are cleared by your physician to drink coffee. Caffeine while pregnant and breastfeeding needs to be cleared by your physician as well. I chose to avoid caffeine while pregnant, but I did drink it for coffee naps occasionally while nursing. Ever heard of too much of a good thing? Tolerance may become an issue once your body gets used to a certain amount. You would then have to drink more caffeine to get results, but remember the research only showed results at moderate amounts. Plus it increases your chances of side effects and nobody wants that. 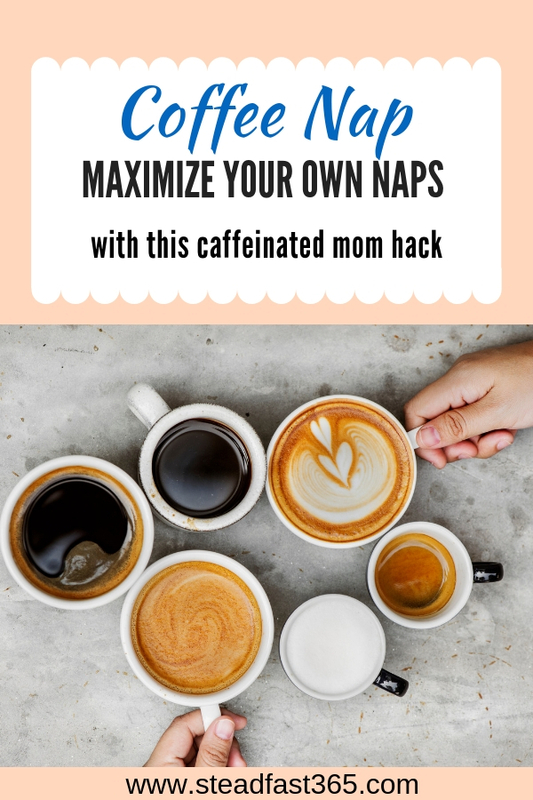 So when we put this together, it was found that studies show that 200mg of caffeine which is roughly 2 cups of coffee taken right at nap time when you’re tired for a nap less than 30 min should result in you waking up feeling more alert than the coffee or nap alone! Don’t forget to set your alarm! I know we love a good mocha caramel anything, but you want to avoid the extra sugar here. It may lead to blood sugar spikes and cause a crash which will make you feel sluggish and that defeats the whole purpose. I know what you’re thinking…soooo…coffee naps, this is a thing? People do this? Where have I been?! I feel you! But now you know and you can help another mama out by sharing this article. We all could keep this one in our back pocket for when we need a little boost! You’re probably going to be exhausted when you want to try this. Mom brain may take over and you may forget the “how to” if you’re anything like me. No worries, I’ve created a quick reminder that you can print out and keep handy. If you don’t already have access then you can just enter your email below to get the printable instantly. If your health allows you to drink caffeine and you want to give it a go, try it and let me know how it works for you. I’m glad you found it interesting! Yes, any excuse to drink coffee is right, haha! This is so very interesting! And quite useful as a person that loves to nap but feels guilty every time she does, lol! My goodness, I totally get it! You deserve a nap! Think of your nap as a way to help your coffee work better so you can be more productive. I never heard of a coffee nap, but found the information behind it very interesting! This is definitely a clever mom hack to help give you energy during naptime! I’m glad you enjoyed the read. I am all about a good mom hack!